This article outlines the processes involved in preparing your site for your Log or Timber Frame Home. Introduction: Selecting the proper building location for your home is important. There are a number of excellent resource books available at your local library or favorite bookstore. Be sure to discuss siting with your sales representative or your builder/contractor. Getting Started: Take time to walk over your land and choose the best building site for your Hearthstone log home. We recommend that you hire a certified land surveyor to assure your building is properly located on your lot and in compliance with any applicable setback or sideyard requirements. Also check property lines, utility and driveway easements. Siting for Solar Exposure: Hearthstone homes of passive solar design require careful site selection. To begin the planning process you will want to chart the sun's path over your building site and determine wind flow. Use a compass to determine magnetic north. Ask a local surveyor or consult your local United States Geological Survey (USGS) on how many degrees to the east or west of compass north is true north. Determine prevailing wind directions for winter storms and summer breezes. Your nearest airport or weather bureau should be able to help, and the information may influence your building site decision. The slope of the land determines the amount of sunshine that will fall on the ground and house. A south facing slope is going to be much warmer than a north facing slope. In general, windows in day time living areas such as kitchens, dining, living and great rooms should face south to admit sunshine. Rooms that have less need for direct sunlight, such as bedrooms and bathrooms, can be placed on the north or east sides. And don't forget the importance of shade trees to screen the home from the hot summer sun and to allow wind flow. Your local library should be able to provide you with information on solar design. Siting for View: The dominant view is not necessarily the preferred location for solar heating needs. If there is a preferred view, and the principals of good orientation cannot be maintained, window shading may be desirable. Common methods of sun control include tinted glass, vertical or horizontal blinds, standard window shades, quilted window coverings and opaque curtains. Roof overhangs and porches can sometimes be designed to block out unwanted sunlight. Be sure to determine how the building setbacks relate to roof overhangs, porches and decks. Sometimes these are allowed to encroach into setback areas. If your design and building site make it difficult to comply with setback requirements, determine if you can obtain a variance from your local building officials. Introduction: Prior to any site preparation for construction, it should be determined which building codes are prevalent. Special attention should be given to requirements necessary to obtain a building permit and to secure financing. General Site Preparation: The Hearthstone Customer Purchase Agreement: Article VI lists minimum standards which must be met by you prior to the delivery of your home. If you have any questions, call your sales representative. Access and Conditions for the Job Site: Keep truck access in mind when preparing the job site and driveway. A loaded tractor trailer and crane truck are up to 60' in length and weigh as much as 60,000 to 80,000 pounds. An unobstructed gravel base road with proper clearances and width is required. Low hanging limbs, sharp curves, steep grades, small bridges, electrical wires, etc. are all obstacles which create challenges and additional expense. The tractor trailer and crane must be able to enter and leave the job site in all weather conditions. Once at the job site, the tractor trailer and crane must be able to be positioned within 10' of the foundation/subfloor on a level-grade base. This will allow the crane boom to have a clear swing to and from the tractor trailer without encountering obstacles. Care must be taken in providing for a level area within reach of a crane and tractor trailer for unloading and storing all the un-erected materials. In reference to the erection of a log package - postponing installation of items such as septic tanks, wells, etc. should be considered due to space and location requirements. You must have 110 volts of electrical power available within 100 feet from the furthest extremity of the foundation. Refer to your Customer Purchase Agreement for more detailed description of access requirements. Waste Disposal: In some rural areas, you may have to provide your own waste disposal system. In most cases this means a septic tank. A septic system needs space for an underground tank and a gravel lined drainage field. Soil must be conducive to drainage for this system to work effectively. To determine whether there may be problems with this kind of system, have a water percolation test made near the building site. Your local building official can suggest a qualified person to perform the "perc test." If you also need to install a well, check with your local extension office agent or building code official to determine the location of your septic tank and drainage field in relation to the well. The septic tank must not interfere with the area required for trucks or crane access. If the septic tank must be installed in the unloading or truck and crane access areas, do not install tank until after the logs are erected. The weight of the delivery trucks can crush the septic tank and cause unnecessary expense in replacement. Give your sales representative a call if you have any questions. Utilities: When you choose the location for your home, contact all utility companies to be sure service is available to you. Entrances for water, electricity, telephone, cable TV or satellite dish feed into your house should be planned in compliance with local regulations. Well: The availability of water and the location of your well is crucial. Before you start to drill for water, check with your local extension office or building official for information such as water tables, water quality and suggested location of well. Also check with area residents for typical well depths to help you with estimating the cost of drilling a well. Water Drainage: Look for evidence of drainage patterns. A good building site has good natural drainage. Poor drainage (excess water) can cause serious foundation damage and excessive soil erosion. Blueprints: Before any work is begun on the footings, be sure that you and your builder are starting construction with a final approved set of blueprints. It is essential that the footings and foundation be installed in accordance with the correct foundation plan and standard details provided as well as any local building codes applicable to your area. Introduction: This outline will give you an overview of Hearthstone's minimum footing and foundation requirements. Consult your builder or building official for local requirements, and become familiar with the foundation and fireplace details in the blueprints. Hearthstone homes are pre-cut and notched prior to delivery. The exact dimensions of your home are predetermined. You will need to notify your sales representative of your foundation type early in the design process so that the appropriate foundation plan may be drawn. Do not start your foundation without the approved Hearthstone details. Footings: All footings must be poured at a depth slightly below your regional frost line. Check with your local building code official to determine the exact depth of the frost line in your area. The concrete footing at basement walls must be built with proper drainage. The detail sheets will show drain sizes and locations. Before pouring concrete for the footing, a structure of continuous metal reinforcement bars is suspended above grade. Refer to Standard Foundation Details for bar sizes, locations and clearance in your blueprints. Foundation Walls: Most foundations are built on a reinforced concrete footing. There are a number of crawl space and basement foundation wall material combinations such as 12" or 10" masonry block or poured concrete foundation walls (or in some cases a combination of both). Other options are also available. All types may have stone or veneer facing of varying thickness. When stone or brick veneer is use, the veneer must be level with the top of the foundation wall. Whichever foundation type is selected, it is important to allow the proper setback for supporting the sub-floor framing on the inside edge while supporting the sill log on the outside edge of the foundation. Typical foundation designs are shown in the Hearthstone blueprints (or details approved by Hearthstone), however the type that you use may be dictated by local building code regulations or geographical location. Foundations commonly used with our homes are: concrete slab floor, pier, crawl space and full basement. 1- Concrete Slab: The slab is basically a large bed of concrete poured over woven wire mesh, a polyethylene vapor barrier and gravel. Refer to the Standard Slab Floor foundation details for construction. Sewer, water, heating, air conditioning, and electrical outlets must be properly installed and located before the slab is poured. It is the responsibility of the owner/contractor to have all pressure treated sill plates installed according to the blueprints prior to log erection. Refer to standard slab details and the foundation plans for your home. Consult local building officials for specific requirements on placement of anchor bolts. Garage Floors: If you are building a garage, the garage floor could be poured at the same time the slab is poured. Make sure your contractor lays out a woven wire mesh to give the slab the extra strength needed to support vehicles. Pour the garage slab with a gentle slope toward the door or a centrally located floor drain. 2-Crawl Space Foundation: With a crawl space, the suggested clearance under your floor joists should be no less than 24 inches to provide easy access to service mechanical, electrical and plumbing systems when necessary. Refer to the Standard Crawl Space foundation details and check with your building official for minimum foundation height requirements. Polyethylene vapor barriers, air vents, and access openings are used with crawl space foundations to protect the sub-floor and floor joists from possible moisture damage. It may be important in some locations to insulate crawl space walls to minimize heat loss. In such instances, insulation should extend from the top of the foundation to the footing. 3-Basement Foundations: Basements allow a full headroom walk-in area and add to the value of your home. The Standard Basement foundation detail sheet will illustrate the proper construction procedures for hollow masonry and poured concrete basement foundation walls. Water-proofing procedures are necessary on the outside of the walls as shown in the details. Backfilling the basement foundation is not recommended until after the subfloor is complete. Disregarding this recommendation will place excessive force on uncured foundation walls introducing the possibility of wall failure. Veneer: If a veneer of brick or stone is to be applied to the exterior surface of the foundation wall, the subfloor setback (set forth in Section 4 below) should be measured from the finished veneer dimension to the outside face of the box sill providing the veneer does not exceed 4" of thickness. Regardless of veneer thickness, a minimum of 2" for log bearing on the foundation must be provided. Veneer must be in place prior to the erection and should be flashed properly to prohibit water accumulation or infiltration beneath the logs. Sill Plate Anchor Bolts: Anchor bolts are set in concrete at the top of the foundation wall and around the perimeter of concrete slabs. The bolts anchor the pressure treated sill plate to the foundation. Make sure that the bolts are set vertically so you don't have to drill angled holes in your treated sill. The bolt should protrude at least 2 &frac12; to 3 inches to leave room for your washer and nut after the sill is installed. If anchor bolts are required by building codes for you foundations, please inform your sales representative. Consult local building officials for specific anchor bolt requirements in your area. Poured Concrete Floors: After building or pouring the foundation walls, the basement floor can be poured. Make sure necessary provisions are made for any rough-in plumbing or electrical needs first. The construction of the concrete floor in a basement is very similar to the construction of the concrete slab floor. Poured concrete floors are typically 4" thick and reinforced with woven wire mesh. Typically they are poured over 4" of crushed stone with a 6 mil polyethylene vapor barrier spread out over the top of the crushed stone. Refer to the Standard Basement foundation details for specific information. Specifications for poured concrete floors are also subject to regulations by local building codes. Foundation Piers and Columns: The foundation plan will accurately show the location of any foundation piers and columns. These are structural supports occurring where the foundation does not have to be continuous. A typical interior support column in a basement will be shown as a concrete filled steel lally pipe column. Concrete block foundation piers are used in supporting the wood sub-floor in a crawl space foundation. Columns and piers require additional reinforced concrete support at the footing and are strategically located for structural support. Important Footing Note: When you get down to the actual pouring of the concrete floor for a slab on grade or basement, make sure that your contractor places all piers and column footings in strict accordance with the Hearthstone foundation plan and that they adhere to specified dimensions. Exterior Porch Piers: Porch piers should not be built until the log or timber frame home is erected unless specifically requested to be in place by blueprints. Location of porch piers may interfere with proper placement of crane used by the erection crew. Also, pre-constructed piers may be subject to damage during the erection process. Soil Treatment: If you home is being built where certain insect pests are a problem, you should take protective measures. In recent years, the pre-treatment of building under construction has become a standard procedure. Professional exterminators should be able to treat the soil and the foundation with the proper chemicals. Contact a reputable exterminator or be sure to discuss this with your builder to be sure this is done at the proper stage of construction. Termite Shield: For additional protection form termites, install a continuous metal termite shield over the top of the foundation wall. This procedure should be punctured only to allow installation over anchor bolts. Wood Debris: Termites may be attracted to wood buried around the foundation. Pick up all the wood and paper debris from around the building site to avoid its being mixed with the backfill. Stacks of lumber at the site should be stored off the ground on concrete blocks or treated timbers. Fireplace Foundations: Fireplace details, foundations and chimney sections are illustrated on the blueprints under the Standard Masonry Fireplace heading. Fireplace foundations should be built according to your local building requirements. Plan ahead for the fireplace foundation. The foundation may be built to allow for a raised hearth if desired, ash dump location, flue, etc. Also, since the wall logs or wall panels are pre-cut at the factory by Hearthstone, it is important to accurately locate the fireplace foundation so that it exactly matches the fireplace location indicated on the blueprints. Do not install the hearth, flue and fireplace chimney until after the package erection. The fireplace foundation should be complete to the subfloor level only. Further construction will hinder or make impossible the erection of the structure. Checking the Foundation: Regardless of the foundation used, the finished measurements must be true and square. An out of square foundation will cause problems throughout the entire construction process. One simple technique to determine if the foundation is square involves running a tape measure on the diagonal corners. Each pair of diagonals should be exactly the same distance apart. A transit is the most accurate way to ensure the foundation is level and that the walls are plumb. Be sure that the outside foundation dimensions on the blueprint are accurately followed. If everything checks out, you are ready to install the floor joists and sub-floor. Do not backfill around the foundation until the subfloor is on. Introduction: When the footings and foundation walls are complete with anchor bolts in place, you are ready for the sill sealer and termite shield, pressure treated sill, floor joists and sub-floor. This section will outline the procedures necessary to complete this stage and be ready for package erection on delivery day. Pressure Treated Sill Plates: The pressure treated sill plate is anchor bolted over the termite shield on top of the foundation wall or concrete slab. The sill plate size may vary depending on the foundation materials selected. Standard foundation details show the placement and size of the treated sill plate that should be used for the foundation you select. Call your sales representative if you or your builder have any questions. Double joists (where two joists are nailed together) are used to carry extra weight such as around stair openings, under wall partitions, and bathtubs. Use metal or wood bridging between joists to prevent movement in the floor. Be sure bridging is installed before the subfloor is laid. Plumbing Considerations: In the construction of the sub-floor, take into consideration where the plumbing walls will be located and make the proper allowances in joist placement. Joist spacing may need to be adjusted to either side under a plumbing wall to allow for the passage of pipes. Box Sill & Sub-floor Setback for Log Construction: See detailed cross sections and your Hearthstone Blueprints first. Joist ends are nailed to the box sill at the outermost edges of the floor system. The box sill is the wood member, on edge, which rests on the pressure treated plate and defines the perimeter of the subfloor. The box sill is secured to the log sill during erection. Box sills are set back 6 1/2" on the foundation wall to allow the Hearthstone sill logs to sit directly on the exterior perimeter of the foundation with 1/2" tolerance for irregularities in either the log or subfloor. Outside dimensions for the floor system are provided on the foundation blueprint and are labeled "Subfloor Plans." NOTE: Some designs do not require a subfloor setback. Contact your sales representative for details. Important Note on Floor Trusses: Special attention must be given if floor trusses are selected in lieu of floor joists. Your foundation details and head heights may change depending on the type of truss you plan to use. If you elect to use floor trusses, notify your sales representative prior to the blueprint work and before the construction of the home so that special provisions can be made. Changing Wood Girder to Steel I-Beam: There may be situations such as in a garage, playroom or family room where a steel I-Beam might be preferred to provide an open area without support columns. Changes from the structural design as shown on your blueprints will require additional engineering to re-size and re-specify structural members and their supporting footings. Check with your local codes and contact your sales representative immediately if you or your builder are contemplating any structural changes. Any undocumented changes or deviations from the structural specifications for Hearthstone Homes will void the warranty. The Subfloor System: The first layer of flooring over the floor joists is called the subfloor. The typical subfloor as specified is to be made of 3/4; in thick tongue and groove plywood available in 4'x 8' sheets. The purpose of the subfloor is to stiffen the floor and provide a work surface while building the rest of the home. Do not apply the finished floor at this time. The subfloor should be flush and square with the joist frame, and should be nailed or screwed and glued to the joists in compliance with manufacturer's recommendations and local codes. Floor Openings: The plans for your home may require openings in the floor for such things as a chimney or staircase. These openings must be framed properly or they will not support the floor. Refer to your floor plans for correct framing dimensions and construction. As a safety precaution, do not cut openings in the subfloor until you are ready to complete the stairs, fireplaces, etc. Subfloor Protection: At this time you should consider protecting the subfloor from soaking rains until your home is erected and dried in. Some builders actually coat the subfloor with a water-repellent preservative. Mountain Construction does custom home building in any building style, including conventional new homes, remodeling and restorations, log and timber frame home and structural insulated panel homes. 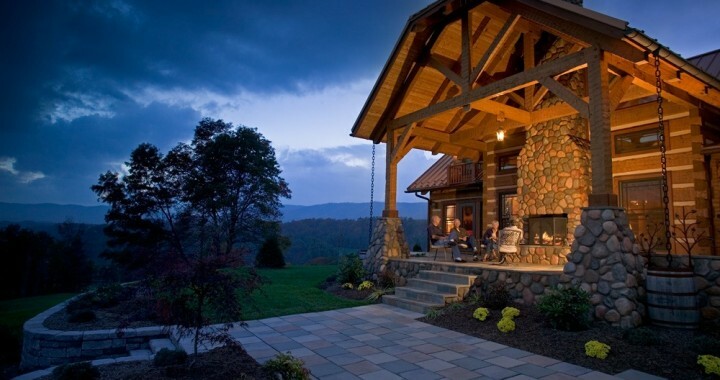 Check out our site and learn more about Log Home Building as well as our other Construction Remodeling services.